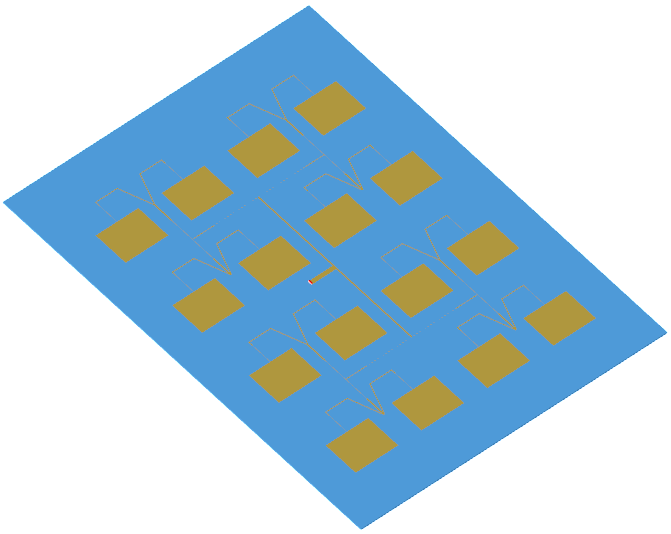 Image of the M-by-N rectangular patch array. 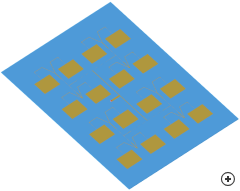 The M-by-N patch array is a more versatile implementation of the linear and planar microstrip patch arrays. There are M patches on the X-axis and N on the Y-axis, where M and N are both powers of 2 (result of exponentiation with as base the number two and as exponent the integer n). The available export models of the M-by-N patch array are parametric for an M by N array where M and N are powers of 2 for the range 2 to 8. An additional export model containing only the parametric corporate feed network - to which any radiating patch element may be added after export - is also available. The gain of the M by N patch array can vary from 11 dBi to 20 dBi (and higher) depending on the number of patch elements. The S11 graph shows the effect of the relative permittivity and substrate height on the impedance bandwidth of the structure.